Yusuke Ito is from Kesenuma City in Miyagi Prefecture and is a third-year student and Student Council member at Kesenuma Municipal Karakuwa Middle School. He participated in the 2012 Japan-America Grassroots Summit in North Texas. 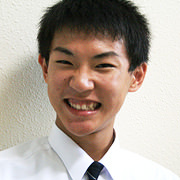 I am Yusuke Ito and I am a third-year students at Kesennuma Municipal Karakuwa Middle School in Miyagi Prefecture. Thank you for providing me with the opportunity to speak in front of everyone. Kesennuma city, where I live, is one of the areas that was greatly affected by the March 11th earthquake last year. Luckily, my home had been barely saved from the destruction of the tsunami, but when you go down the hill a few meters to the next house, you will see the destruction left behind by the tsunami. Immediately after the earthquake, it was difficult to even keep warm. Even in these hard times, we did not forget to help each other. Even in a special environment such as an evacuation shelter, people shared the little amount of emergency food that we had. If someone had a usable well, they shared it with others. It gave me pride that even in times of distress, people helped each other. I personally learned the importance of this mutual interaction and assistance. This summer, with the help from the TOMODACHI Initiative, I had the opportunity to participate in the Grassroots Summit in North Texas in the south of America as a representative of Kesennuma Municipal Karakuwa Middle School. At the Grassroots Summit, from the time the airplane departed from Japan to when the bus returned home, I met new and different people every day. From the translators who participated in the Summit to the volunteers involved in organizing the Summit, I was able to understand the importance of people-to-people relationships and direct exchanges through the opportunity I received from TOMODACHI. The next time I visit America, I would like to be able to communicate better in English so that I can directly express my appreciation to everyone. Lastly, I would like to talk about my future goals. I am very interested in history. Therefore, I would like to attend a university and study history, and eventually become an international professor who has the ability to teach history in English to foreign students.